October oil field is one of the largest hydrocarbon-bearing fields which produces oil from the sand section of the Lower Miocene Asl Formation. Two marl (Asl Marl) and shale (Hawara Formation) sections of possible source enrichment are detected above and below this oil sand section, respectively. This study aims to identify the content of the total organic carbon based on the density log and a combination technique of the resistivity and porosity logs (Δlog R Technique). The available geochemical analyses are used to calibrate the constants of the TOC and the level of maturity (LOM) used in the (Δlog R Technique). The geochemical-based LOM is found as 9.0 and the calibrated constants of the Asl Marl and Hawara Formation are found as 11.68, 3.88 and 8.77, 2.80, respectively. Fair to good TOC% content values (0.88 to 1.85) were recorded for Asl Marl section in the majority of the studied wells, while less than 0.5% is recorded for the Hawara Formation. The lateral distribution maps show that most of the TOC% enrichments are concentrated at central and eastern parts of the study area, providing a good source for the hydrocarbons encountered in the underlying Asl Sand section. October Field is the third largest field in Egypt. It is structurally trapped in a complex of rotated fault blocks [1,2], a common scenario throughout the Gulf of Suez. The main oil reservoirs are the Carboniferous to Lower Cretaceous Nubia sandstone and the Miocene Asl sandstone . It consists of many marine platforms which produces oil from different reservoirs of different geologic ages. The first platform (A) was installed in 1977 at the southwestern block of October concession, after the discovery of GS 195-1 well (OCT-A1). This well had an initial production rate of 14.000 BOPD from Nubia oil reservoir . This is followed by establishing many other northward platforms (B, C, D and G) to define and examine the northern limits of Nubia and Nukhul reservoirs . In 1989, the Asl reservoir sand (Miocene) was discovered by the drilling of NO 183-1 well, on the hanging wall of a large normal fault bounding the west of October field. From this date and upcoming a large number of wells were drilled in this newly discovered “J” named platform and around it . Asl Formation is subdivided into two zones; an upper zone which consists mainly of marl (Asl Marl) and a lower zone of complete sand lithology (Asl Sand). Asl Sand zone is considered the main oil reservoir in the study area. Meanwhile, the marl section of the Asl formation and the shales of Hawara formation are considered the main possible sources rocks in October field area. Source rocks are commonly shales and lime-mudstones that contain significant amounts of organic matter. Non-source rocks also contain organic matter, but the amount is generally not significant . Good hydrocarbon source rocks must contain organic matter higher than 1% (wt% TOC). These organic materials could only generate hydrocarbons, if they reach a level of thermal maturation high enough to generate and expel comercial quantities of oil and/or gas . 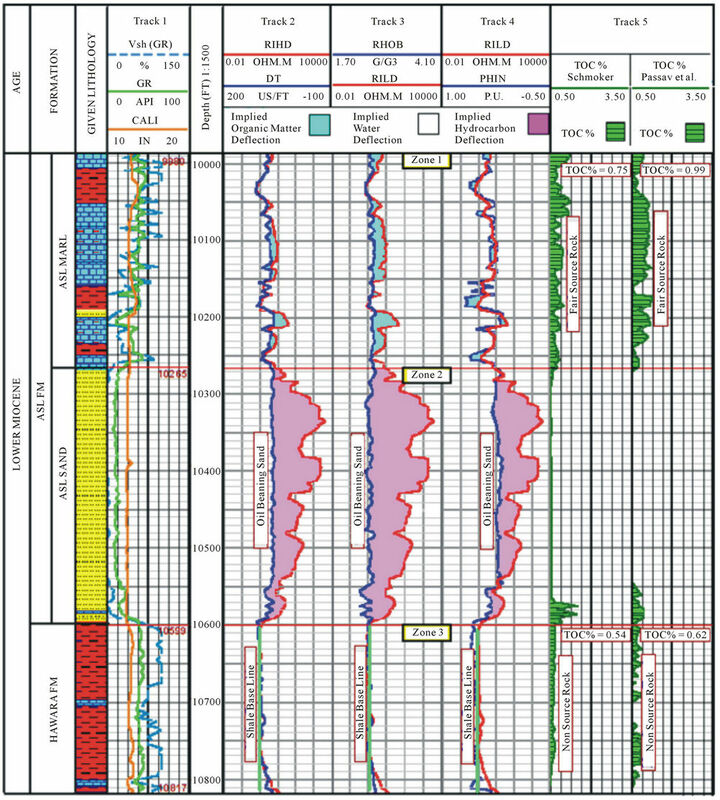 Well logging methodology in geochemical evaluation is very important technique not only for its usefulness as a quick scan of potential source rock, but also in its ability to identify the organic richness (TOC%) of these rocks [7,9-18]. Many authors had studied the possible source rocks of the Gulf of Suez. The most important is the work done by  in which the Globigerina Marls of Lower Miocene age is suggested to be the possible source rocks of all the oil in the Gulf of Suez. Shahin and Shehab  pointed out that Campanian brown limestone and Paleocene Esna shale, besides some intervals of Matulla Formation are the most prolific oil sources among the PreMiocene rocks. Moreover they suggested some intervals of Lower Miocene age to be the source of the oil in southern portion of Gulf of Suez. Soliman  carried out some geochemical analysis over some samples collected from October Field. Shahin  said that PreMiocene sediments are the main source of hydrocarbons in the northern parts of Gulf of Suez. He pointed out that intervals from Nubia, Matulla, Wata, Sudr, Esna and Thebes Formations, although they have a wide range of age, but still simultaneously active within the hydrocarbon generation limits. He also found that the time of oil expulsion and migration postdates the deposition of South Gharib Formation, which represents the seal rock of the Miocene reservoirs. In the complied report of the US Geological Survey (world energy project), Lindquist  had clarified that two major oil sources for the hydrocarbons in the Red Sea and Gulf of Suez were indicated. The first is the Campanian Sudr (Brown/Dawi) source rocks, while the second is the Middle Miocene Maqna source rocks. Another important work was done also by [23,24]. This study aims mainly to investigate the organic richness and to estimate the total organic carbon content (TOC%) of the Asl Marl section and Hawara Formation using a methodology based on the density log and combination of the resistivity and porosity tools. Nine wells with complete well logging data sets are utilized for this purpose (Figure 1). Figure 1. Location map of October oil field, Gulf of Suez-Egypt. The Gulf of Suez graben or rift basin was created by stretching and collapse of the crust. This process is often associated with hydrocarbon accumulation. Subsidence moves potential source rocks to depths suitable for oil and gas generation and the stretching motion can produce structural traps in the fault blocks, which characterize rift basins [2,3,25-29]. The Gulf of Suez is subdivided into three structural provinces according to their structural setting and regional dip direction and separated from each other by two NNE-SSW hinge zones . They are from north to south Ataqa, Gharib and Zeit provinces (Figure 2). 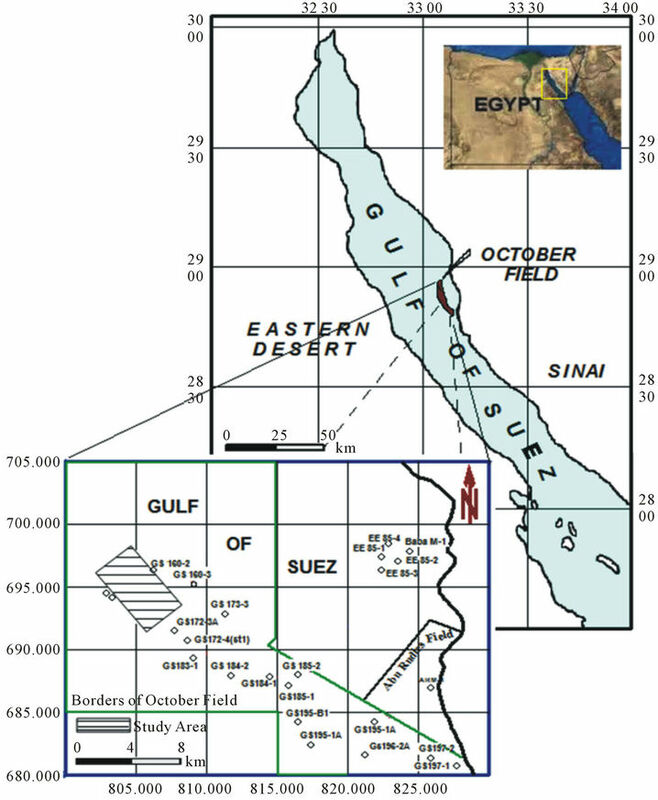 The stratigraphic sequence of the Gulf of Suez has been studied by many workers. It ranges in age from Pre-Cambrian to Recent. 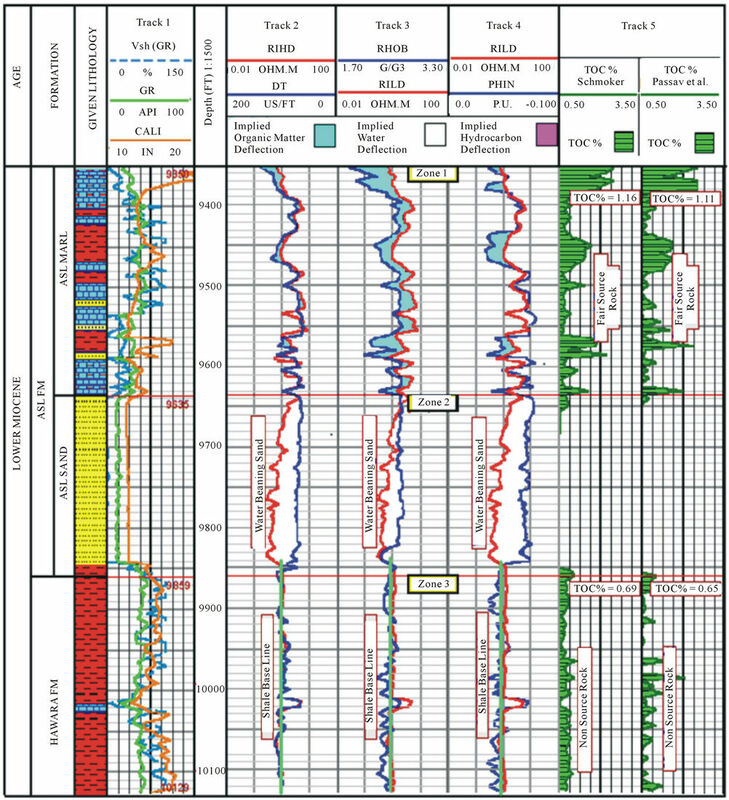 Figure 3 shows the generalized stratigraphic column of northern Gulf of Suez in which three depositional phases are generally assumed . The first comprises the deposition of formations ranging in age from a postulated Devonian to Eocene. These formations, which include the Nubia Sandstone, are important as reservoir rocks and to a lesser extent as source rocks. The second phase is represented by the Lower Miocene and is characterized by its overall excellent qualities as source, reservoir and seal rocks. The third phase represents formations of Middle Miocene to Pliocene in age. This phase closes the depositional history of the Suez graben area. In the present study we focused mainly on the marl and shale sections of the Lower Miocene rocks of the Asl and Hawara formations. Figure 2. Structure provinces of Gulf of Suez (after EGBC and Biecip, 1988). Figure 3. 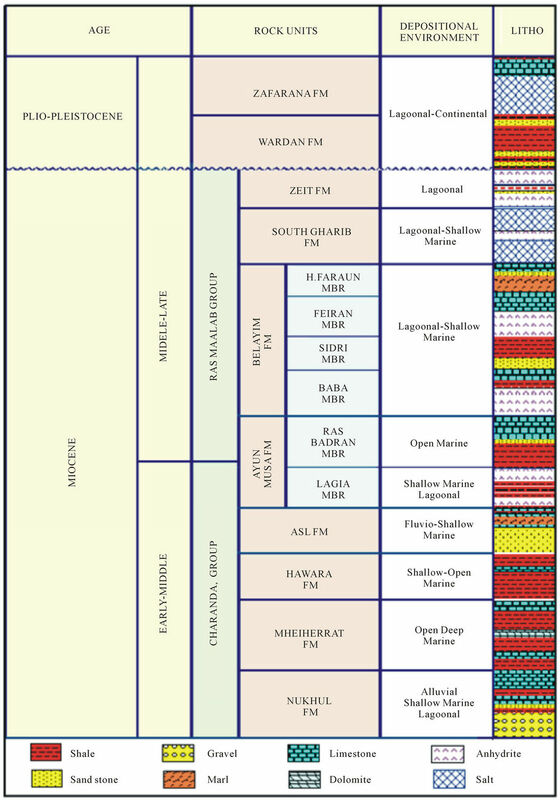 A generalized stratigraphic column of the Gulf of Suez. composed primarily of only two components i.e., the rock matrix and the fluid filling the pore space. As the source rock matures, a portion of the solid organic matter is transformed to liquid hydrocarbons which move into the pore space displacing the formation water. This is essentially the model described by [31-35]. These physical transformations affect the porosity, density and resistivity of the rocks and hence reflected in their electric logs . According to the classification made by , the potentialities of source rocks on basis of organic carbon richness can be classified as follows; poor source rock (TOC% < 0.5), faire source rock (TOC% 0.50 - 1.0), good source rock (TOC% 1.0 - 2.0) and excellent source rock (TOC% > 2.0). In the present study the total organic carbon is estimated using two different methods. The first (Δlog R Technique) is proposed by [7,9] and depends on the combination of resistivity with porosity logs, while in the second method of , the organic carbon content (TOC%) is related to the density log only. In the following section, a detailed description of both methods will be provided. where, Δlog R is the curve separation measured in logarithmic resistivity cycles, Rt is the true resistivity log reading, Δt is the sonic log reading, Rtbl and Δtbl are the base-lined resistivity and sonic readings in front of nonsource shale, and 0.02 is a constant based on the ratio of 50 µsec/ft per one resistivity cycle. where, TOC is the total organic carbon content and LOM is the level of maturity (ranges between 7 and 12 for mature oil). where, is the density log reading, and A and B are constants varying depending on the formation of interest. In the present study, the available geochemical analyses obtained from the geochemical analysis of some of the drilled wells in October Filed area, are used to calibrate both of the constants (A and B) of the density log method  and the level of maturity of the hydrocarbon (LOM) that is used in the Δlog R technique . 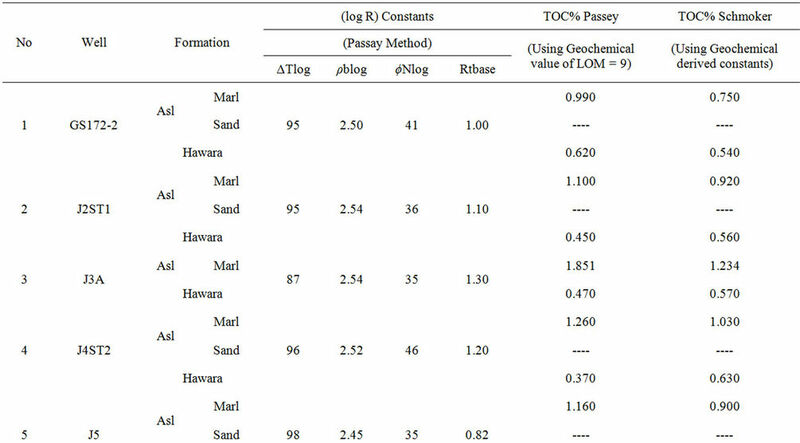 Based on the geochemical analyses, the utilized A and B constants are found to be 11.68 and 3.88 for Asl formation, and 8.77 and 2.80 for Hawara formation, while the level of maturity is taken as 9.0. Table 1 illustrates the different ΔT-R constants and the estimated TOC% values as concluded from both methods. Although there are some differences in the calculated TOC% values obtained by [9,11], still these values are in the same organic richness range. Based on the obtained results by and depending on  classification Asl Marl section is classified as faire to good source rock, while Hawara Formation is regarded as poor source rock. The following is a detailed evaluation of the concluded results. Figures 4-8 show the organic richness analyses for some selected wells in the study area, besides their interpretation and representation vertically with depth. Each figure reveals the different interpreted Δlog R separations (Tracks 2, 3 and 4) and the final deduced TOC% values using both techniques (Track 5). The values obtained from Passey method are used only in final interpretation because it gives more reliable results than the other methods. Table 1. The different ΔLog R constants and the estimated TOC% values as concluded from Passey and Schmoker methods. wells. Regarding these figures, a rightward big deflection of the resistivity log on the expense of the porosity logs in front of the shale and marl intervals can be seen. Asl Sand is composed mainly of sandstone with no reasonable organic matter. Figure 4 shows the Δlog R separation in front of the oil-bearing Asl Sand in GS 172-2 well. Good hydrocarbon deflection associated with large Δlog R separations is observed in front of the oil zone. Figure 4. The estimated total carbon content (TOC%) of GS 172-2 well. The oil-bearing nature of Asl Sand section is also indicated. A suggested oil-water contact is well observed in the Asl Sand section of J6A well at depth 11055ft (Figure 6). The upper part of Asl Sand in this well exhibits good hydrocarbon saturations (rightward deflection of resistivity log) while the lower part attains 100% water saturation (leftward deflection of resistivity log). Figure 5. The estimated total carbon content (TOC%) of NO 159-1 well. The water-bearing nature of Asl Sand section is also indicated. source nature of this formation. Figure 6. The estimated total carbon content (TOC%) of J6A well showing the oil-water contact clearly. exhibited in NO 159-2 well (Figure 7). The TOC% map of Hawara Formation (Figure 8) reveals a very low content of TOC % of less than 1% indicating the non-source rock characteristics of this formation. 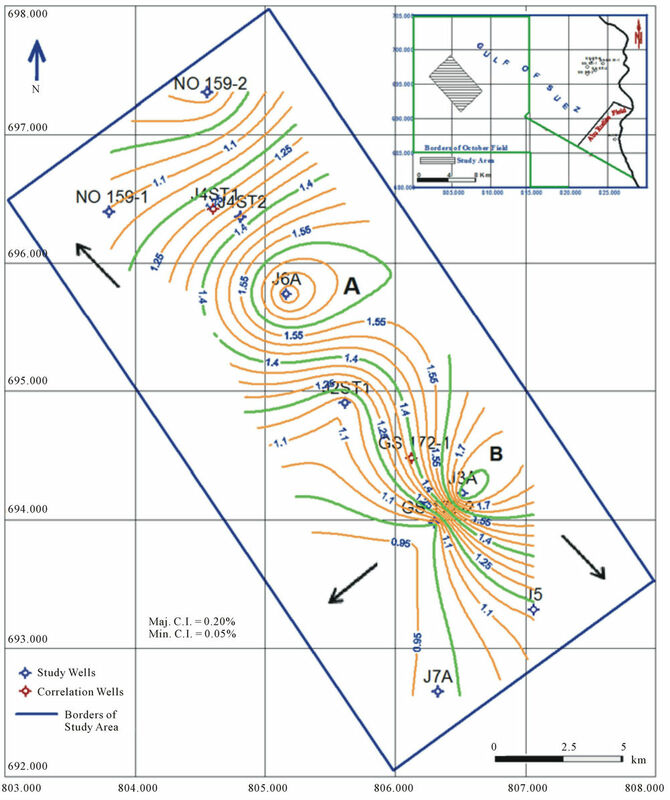 Two very low anomalies (C and D) are well recognized with a minimum TOC% value of 0.37% at J4ST2 well. A maximum TOC% value of 0.65% is recorded at NO 159-1 well. Figure 7. TOC% lateral distribution map of the Asl Marl section, in the study area. • A geochemical-based level of maturity (LOM) of 9.0 is used for calculating the total carbon content (TOC%). • A good TOC% content in assigned for the Asl Marl section (0.88 to 1.85). • Fair-to-poor content (less than 1%) for the Hawara Formation. Figure 8. TOC% lateral distribution map of Hawara Formation, in the study area. • The distribution maps of the TOC% show a good concentration of TOC% at the central and eastern parts of the study area and low content at the northern and southern margins. • Due to its relative enrichment in the TOC% content, the Asl Marl section is considered a possible source of the implied hydrocarbons in the underlying Asl Sand section. This work is supported by the Scientific Research Centre, College of Sciences, King Saud University. EGPC and Biecip, “Structural Evolution and Tectonic Modeling in the Gulf of Suez,” Internal Report, 1988. A. Rashed, “The Main Fault Trends in the Gulf of Suez and Their Role in Oil Entrapment,” 10th Petroleum Exploration and Production Conference, Cairo, No. I, 19-22 November 1990, pp. 143-178. 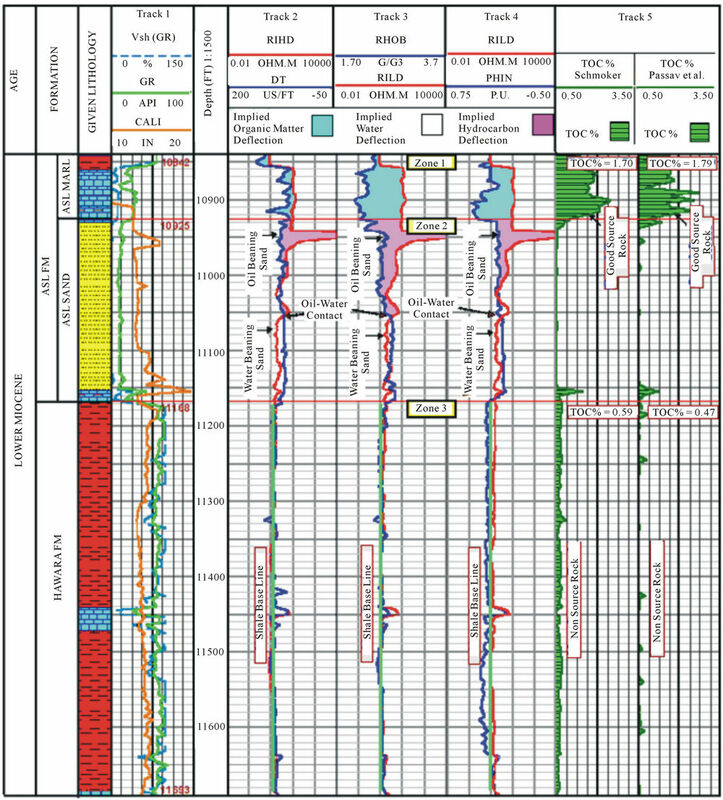 Schlumberger, “Well Evaluation Conference-Egypt,” Houston, 1995, 87 p.
Gupco, “The Geology of October ‘D’ Platform Well Area. Gupco,” Internal Report, 1982. Gupco, “October G-1 Well Recommendation. Gupco,” Internal Report, 1987. Gupco, “Oil Fields in Gulf of Suez. Gupco,” Internal Report, 1994. Q. R., Passey, S., Creany, J. B, Kulla, F. J., Moretti and J. D, Stroud, “A Practical Model for Organic Richness from Porosity and Resistivity Logs,” AAPG, Vol. 74, No. 12, 1990, pp. 1777-1794. J. S., Lindquist, “The Red Sea Basin Province: SudrNubia and Maqna Petroleum Systems,” US Department of Interior, US Geological Survey, Open File Report No. 99-50-A, 1889, 21 p.
Q. R. Passey, S. Creany, J. B. Kulla, F. J. Moretti and J. D. Stroud, “Well Log Evaluation of Organic Rich Rocks,” 14th International Meeting on Organic Geochemistry, Paris, 18-22 September 1989, Abstract 75. J. W. Schmoker, “Determination of Organic Content of Appalachian Devonian Shales from Formation Density Logs,” AAPG Bulletin, Vol. 63, 1979, pp. 1504-1537. J. W. Schmoker and T. C. Hester, “Organic Carbon on Bakken Formation, United States Portion of Williston Basin,” AAPG Bulletin, Vol. 67, No. 12, 1983, pp. 2165- 2174. R. Hills, “Quantification of Tertiary Exhumation in the United Kingdom South North Sea Using Sonic Velocity Data,” AAPG Bulletin, Vol. 79, No. 1, 1995, pp. 130-159. D. L. Hall, W. Shentwu, M. Sterner and P. D. Wagner, “Using Fluid Inclusions to Explore for Oil and Gas,” Hart’s Petroleum Engineer International, Vol. 11, 1997, pp. 29-34. M. Faqira, A. Bhullar and A. Ahmed, “Silurian Qusaiba Shale Play: Distribution and Characteristics,” AAPG Heidelberg Conference, Austin, 2010, 2 p.
O. Kavak, J. Connan, N. Y. Erik and M. N. Yalçin, “Organic Geochemical Characteristics of Şırnak Asphaltites in Southeast Anatolia, Turkey,” Oil shale, Vol. 27, No. 1, 2010, pp. 58-83. M. Shayesteh, “Source Rock Analysis from Well Logs in the Southern Dezful Embayment,” The 2nd South Asian Geoscience Conference and Exhibition, GEOIndia, Gearter Noida, New Delhi, 2011, 4 p.
A. N. Shahin and M. M. Shehab, “Petroleum Generation, Migration and Accumulation in the Gulf of Suez Offshore, Sinai,” 6th E.G.P.C, Exploration Seminar, Vol. 1, 1984, pp. 126-152. O. M. Soliman, “Petroleum Habitat in the Vicinity of October Oil Field, Gulf of Suez,” Unpublished MSc Thesis, Suez Canal University, Suez Canal, 1988. A. N. Shahin, “Oil Windows in the Gulf of Suez Basin, Egypt,” AAPG Bulletin, Vol. 72, 1988, 14 p.
B. G. Rhorback, “Crude Oil Geochemistry of the Gulf of Suez,” 6th E.G.P.C Exploration Seminar, Vol. 1, 1982, pp. 212-224. M. G. Barakat, M. Darwish, A. Hassouba and M. Salah, “Rifting-Related Sequences and Hydrocarbon Habitat in the Southern Gulf of Suez and Northern Red Sea Province, Egypt,” 2nd International Conference, Geology of the Arab World, Cairo University, Cairo, 1994, pp. 157- 184. M. Hagras, “Some Geological Observation in the Gulf of Suez Area, Egypt,” 8th E.G.P.C, Exploration Conference, Cairo, November 1986. W. Meshref, M. Abu El-Karamat and M. El-Gindi, “Exploration Concept for Oil in the Gulf of Suez,” 9th E.G.P.C, Exploration Conference, Cairo, November 1988. 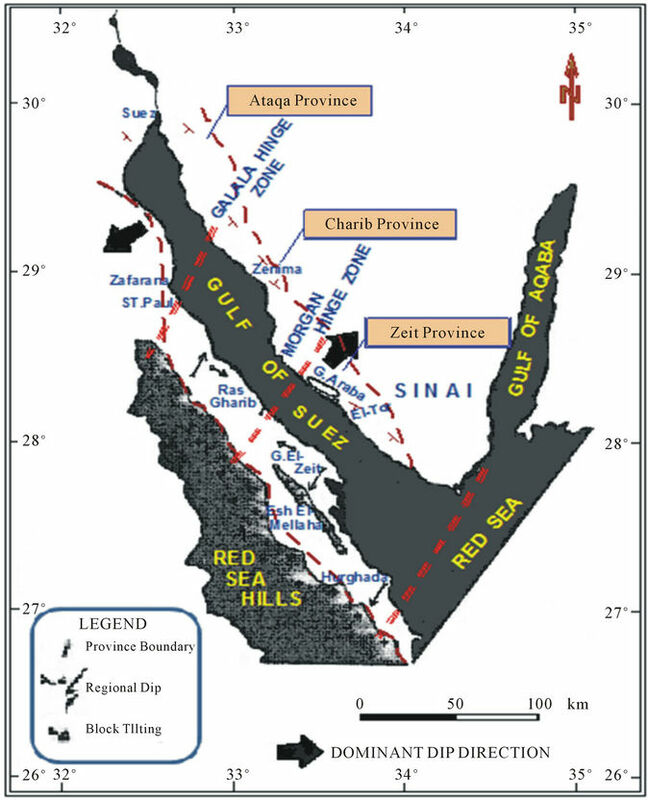 A., Lashin and M. Abd El Aal, “Seismic Data Analysis to Detect the Depositional Process Environment and the Structural Framework of East Central Part of Gharib Province, Egypt,” Annals of Geological Survey of Egypt, Vol. 27, 2004, pp. 523-550. Schlumberger, “Well Evaluation Conference,” Egypt. France, 1984, 60 p.
R. P. Nixon, “Oil Source Beds in Cretaceous Mowry Shale of Northwestern Interior United States,” AAPG Bulletin, Vol. 57, No. 1, 1973, pp. 136-161. F. F., Meissner, “Petroleum Geology of the Bakken Formation, Williston Basin, North Dakota and Montana, in the Economic Geology of the Williston Basin,” Williston Basin Symposium, Montana Geological Society, 1978, pp. 207-277. B. L. Meyer and M. H. Nederlof, “Identification of Source Rocks on Wire-Line Logs by Density/Resistivity and Sonic Transit Time/Resistivity Crossplots,” AAPG Bulletin, Vol. 68, 1984, pp. 121-129. J. D. Mendelson and M. N. Toksoz, “Source Rock Characterization Using Multivariate Analysis of Log Data,” Transactions of the 26th SPWLA, Annual Logging Symposium, Paper UU, 1985. 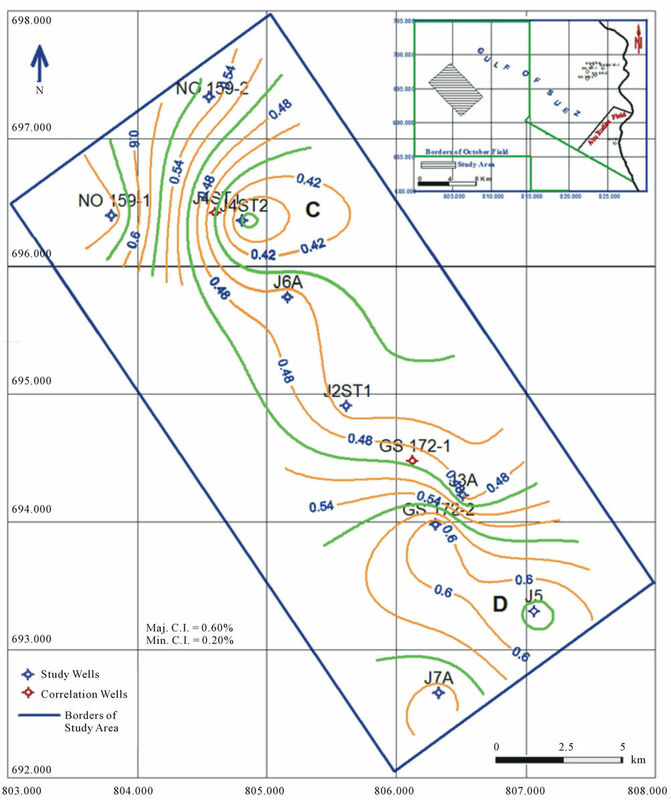 B. M. Thomas, “Geochemical Analysis of Hydrocarbon Occurrences in Northern Peth Basin Australia,” AAPG Bulletin, Vol. 63, 1979, pp. 1092-1102.